The Tax Cuts and Jobs Act represented the most comprehensive tax code changes in decades, reducing tax rates for individuals and corporations and making modifications to many rules including deductions. This new tax landscape could have a significant impact on year-end income planning for many taxpayers. The top concern for most investors is how the law will affect their tax bills. The Tax Policy Center estimates that about 65% of households will pay less in taxes, 29% will pay approximately the same as last year, and 6% will pay more. A good starting point is to determine your marginal tax bracket under the new rules. This will drive decisions around the timing of income at year-end. Once a tax bracket is determined, investors can consult with their financial advisor and tax professional to see if it makes sense to defer income, reduce income, or realize income before the end of the year. Lower tax brackets may create opportunity for some individuals to realize income now, such as converting to a Roth IRA. For example, some taxpayers in the new 24% bracket may have been subject to a 33% bracket previously, reducing the effective tax cost of converting. Changes to popular deductions are one of the major outcomes of the new law. Taxpayers accustomed to writing off large amounts of state and local taxes (SALT), miscellaneous deductions, or mortgage interest, need to consider the potential limitation or loss of these tax deductions. 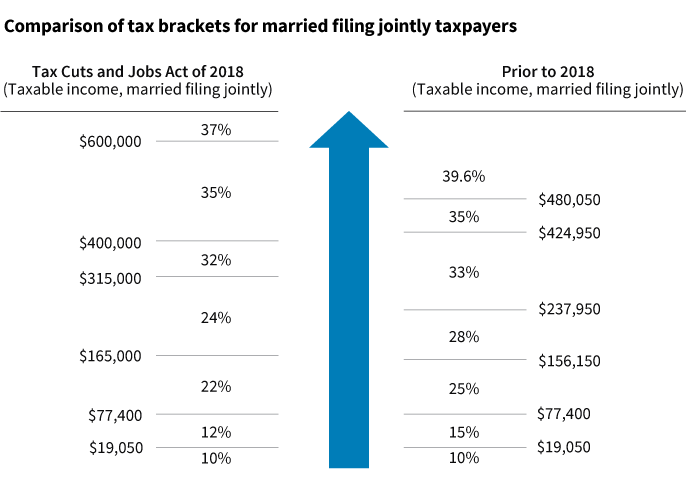 Many taxpayers will shift from itemizing deductions on their return to claiming the standard deduction, which has nearly doubled ($12,000 for individual filers, $24,000 for those married couples filing a joint return*). Taxpayers claiming the standard deduction may want to consider “bunching” several years of deductions, such as charitable gifts, into one year in order to be able to itemize deductions that year. Individuals age 70½ and older, who are taking the standard deduction, may consider donating to charity by distributing funds tax free from an IRA. The number of AMT taxpayers is expected to drop precipitously, from roughly 5 million to only 200,000 in 2018. Certain planning considerations could be easier for some taxpayers, particularly for individuals contemplating exercise of incentive stock options (ISOs). The “bargain element” upon exercise of the option is considered taxable for AMT purposes. For taxpayers who may not be subject to the AMT anymore, the decision of whether to convert ISOs may be a little simpler. Year-end is an opportune time to review portfolio allocations with a financial advisor. Given widespread capital gains in many areas, it may be prudent to look for ways to offset gains by realizing losses, if possible. There may also be opportunities to defer unrealized capital gains in certain assets through investing in a Qualified Opportunity Zone (QOF) or by utilizing a 1031 exchange for appreciated real estate.